Many companies looking to implement a lead generation or inbound marketing program want to know the best way to reach their goal. 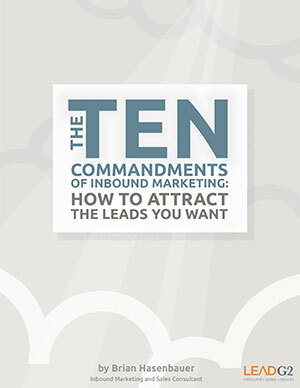 This is precisely the reason we created The Ten Commandments of Inbound Marketing. A commandment in its basic definition is a written rule that you must follow. With inbound marketing and lead generation, there is a lot to do when first getting started. In addition, there are a few things that will contribute to the success or failure of your lead generation program. Get the free eBook by filling out the form.